MONSTROUS swell is lashing the Queensland coastline, with brave surfers tackling the waves as businesses sandbag their properties from rising high tides. Nearly all southeast Queensland beaches remain closed - all on the Gold Coast and most on the Sunshine Coast as dangerous conditions spark a severe weather warning for the area. 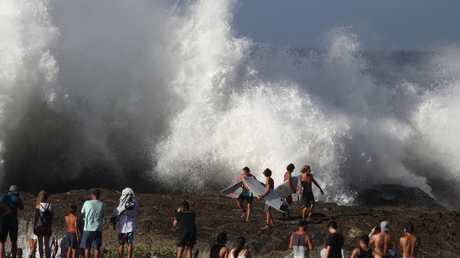 High tides and dangerous surf have sparked rescues of 27 people, including 13 surfers who attempted to battle giant sets reaching up to 10m. Only experienced surfers are advised to venture out in the waves that some are labelling the best in decades. Severe erosion is also posing dangers along the coastline. "It does look like it's going to start moving north again, possibly northwest back towards the northern Queensland coast," the Bureau of Meteorology's Michael Knepp told AAP. "But that's still far away into the future." Floods have devastated coastal and inland areas north Queensland region in recent weeks, with 2950 homes damaged in Townsville and more than 500,000 cattle dead further west. While Oma has been downgraded to a subtropical low, dangerous conditions at some beaches remain amid abnormally high tides and large swells. Beachgoers in Queensland and northern NSW are still being warned about dangerous conditions, with the storm continuing to bring abnormally high tides, damaging winds, large swells and heavy erosion. Yesterday, experts warned Oma had become "double the size of Debbie" - one of the most dangerous cyclones to ever form in Australia. 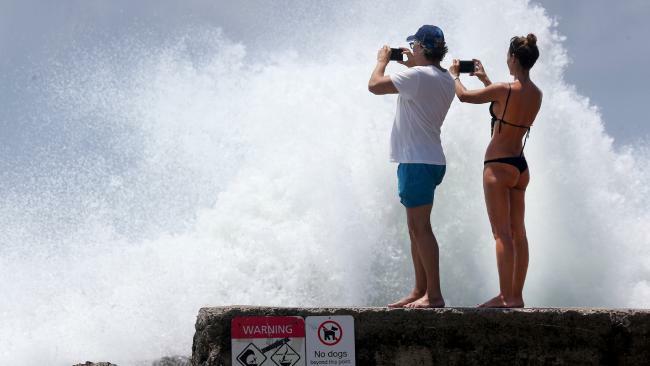 Bureau of Meteorology Queensland state manager Bruce Gunn said Cyclone Oma had weakened to a low pressure system but that it was forecast to reintensify to category two strength and maintain its force for some time as it sat off the state's southeast coast. "It's approximately twice the diameter of Cyclone Debbie," Mr Gunn said on Saturday. "We will certainly continue to keep a close eye on this cyclone, until it no longer poses a threat. Surf Life Saving NSW chief operating officer Phil Ayres urged beachgoers to remember if the flags were down, it was not safe to swim. Mr Ayres said the conditions were "extremely challenging" and urged surfers and swimmers not to over-estimate their ability and underestimate the power of the ocean.